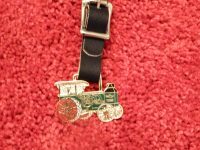 The Advance-Rumely Company of La Porte, Indiana was organized in 1915 as a producer of many types of agricultural machinery, most notably threshing machines and large tractors. Advance-Rumely was purchased by Allis-Chalmers Manufacturing Company in 1931, and the company’s main works would become what was later known as the “La Porte plant”. Thanks to various mergers and acquisitions, the company’s origins stretched as far back as 1836. However, the origin of the two components of the corporate name—Advance Thresher Company and M. Rumely Company—were somewhat newer, though still long-lived in the agricultural equipment industry. Meinrad Rumely emigrated from Germany in 1848, joining his brother John in the operation of a foundry in La Porte, Indiana. This basic operation gradually expanded by 1859 into the production of corn shellers and complete threshing machines powered by horses. Following success in this new field, Meinrad then bought out his brother’s portion of the business and incorporated it as the M. Rumely Company by 1887. Starting in 1895, the line expanded to include steam-powered traction engines. Meinrad died in 1904, but his sons continued to manage the business. Rumely’s most famous product, the kerosene-powered Rumely OilPull traction engine, was first developed in 1909 and began selling to the public by 1910. 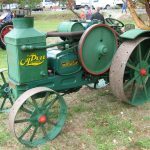 From 1911-1912, M. Rumely Company began purchasing other firms in the agricultural equipment business. Both Advance Thresher Company and Gaar-Scott & Company were acquired during 1911. Then, in 1912, Rumely expanded further with the purchase of Northwest Thresher Company (out of Stillwater, Minnesota) and the American-Abell Engine and Thresher Company (out of Toronto, Ontario). As early as January 1930, the Rumely management began seeking a buyer for the company. Correspondence with Otto Falk, president of the Allis-Chalmers Manufacturing Company, proved fruitful: Allis-Chalmers agreed to take over the firm and did so by May 1931. Rumely had already discontinued its traction engine lines in favor of newer-style tractors, but Allis-Chalmers had a line of those that was quite successful. 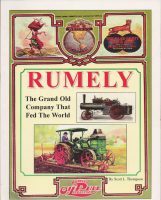 The remaining Rumely-branded tractors were discontinued. Allis-Chalmers was more interested in Advance-Rumely’s line of threshing and harvesting machines (not to mention the sprawling plants that built them). Also of interest to Allis-Chalmers was Rumely’s extensive dealer network, which was instantly converted to the complete Allis-Chalmers product line. And the “La Porte plant”, as Advance-Rumely’s main headquarters was now called, became known as the “Harvester Capitol of the World” thanks to its eventual production of Allis-Chalmers’ successful All-Crop harvester line. Allis-Chalmers would eventually succumb to bankruptcy and the dismantling of its vast business interests in 1985, but by that time Advance-Rumely was only a memory.